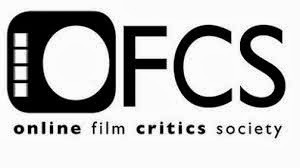 87 min., not rated (equivalent of an R). If the office drones from “Office Space” acted on murderous impulse, “The Belko Experiment”-style, due to a viral outbreak, director Joe Lynch (2015’s “Evelyn”) and screenwriter Matias Caruso’s “Mayhem” would be the lunatic bloodbath. A satirically blunt indictment of corporate greed and a corrupt system, the film finds its own individuality as a mad-as-hell, metal-infused genre concoction that often plays like a frenetic, destructive video game on speed, and that is a giant compliment. 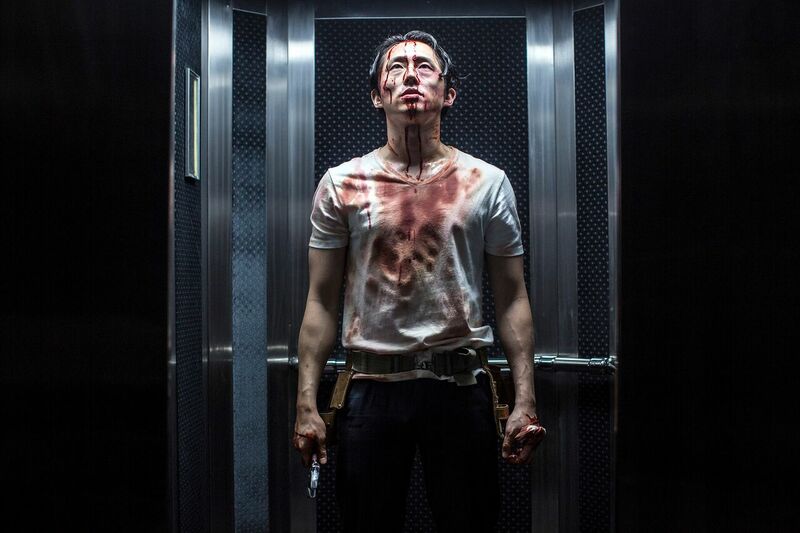 Between the Greg McLean-helmed, Sean Gunn-penned “The Belko Experiment” from earlier this year and now “Mayhem,” there must be something cathartic for genre filmmakers who paid their dues working in a cubicle about sticking it to the 1%. "Mayhem" is one insane workplace comedy with misanthropic bite and bloody exploitation aplenty. 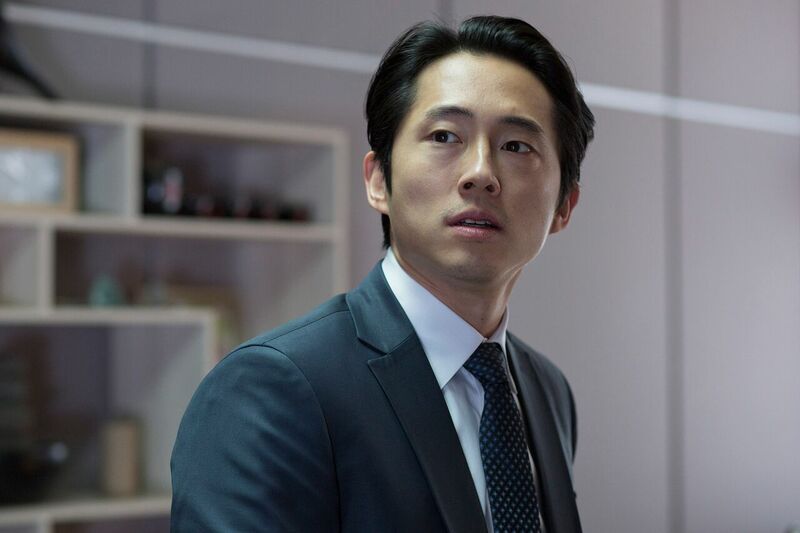 Successful but feeling like he’s sold his soul to law firm Towers & Smythe Consulting with little to show for it except for a corner office, executive associate legal analyst Derek Cho (Steven Yeun) is about to have the day from Hell. First, he discovers his precious coffee mug has been stolen by his fierce, condescending superior, Kara Powell (Caroline Chikezie), whom he dubs “The Siren." Then, after Kara throws Derek under the bus and gets into the ear of pompous, coke-snorting CEO John Towers (Steven Brand), aka “The Boss,” with no help from HR head honcho, “The Reaper” (Dallas Roberts), he is terminated. Just as Derek is escorted out of the building, a SWAT team and people in Hazmat suits arrive to quarantine the firm. While no one inside has noticed they all display symptoms with a red eye, the ID-7 Virus—an airborne strain that attacks the infected’s id and forces an imbalance between emotion and reason—spreads like wild fire through the office building. Taken out by the CEO’s bodyguards in the basement, Derek soon comes to and teams up with Melanie Cross (Samara Weaving), who not long before Derek’s termination was turned away when she tried fighting a foreclosure notice on her home. Armed with nail guns, hammers, electric saws, wrenches, and their own temporary insanity, Derek and Melanie aren’t about to stay calm, even though all traces of the virus are said to be eliminated in approximately eight hours with an antidote pumped into the ventilation system. 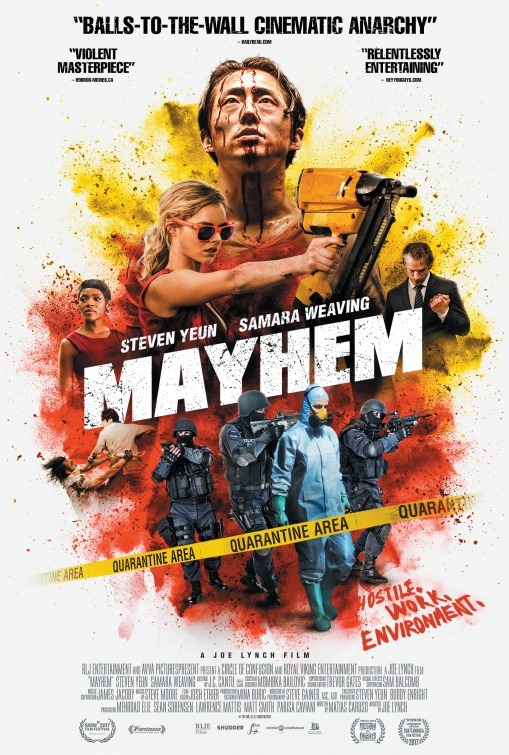 Following a fair amount of exposition-heavy setup, “Mayhem” never takes its foot off the gas with a humorously mean spirit, lots of ultra-violence, and a frenzied energy that proves infectious. Throwing a virus into a law firm is an extremely clever idea, especially when the sufferers can't be prosecuted for murder once the "red eye virus" is out of their systems. Told through flashback with deadpan narration by Derek and cutaways to paintings he’s created, the film opens with the in medias res damage of a previous viral outbreak in an Iowa office building. Though the rules are efficiently laid out, the ID-7 Virus mostly serves as a McGuffin to accelerate all of the anarchy and carnage that ensue. Once TSC gets hit, all inhibitions are thrown to the wind, as Derek’s afflicted colleagues begin acting violently and not holding back their sexual impulses. It’s advised by a quarantine specialist that stressful work-related situations should be avoided, but that’s a lot easier said than done. Also, stimulants, including caffeine, accelerate the effect of the virus, but “The Siren” keeps screaming for more coffee from her assistant. Having a blast with the gleefully gonzo tone of the film, Steven Yeun (TV’s “The Walking Dead”) and Samara Weaving (2017’s “The Babysitter”) make spectacular impressions on their own and form a badass team. Yeun is charismatic, assertive and quick-witted as Derek, and with a demented smile and a glint in her eye as Melanie, Weaving makes for an enthusiastic foil with a cool presence and sharp comic timing. As Derek and Melanie are hellbent on crawling their way upstairs where the top-of-the-food-chain scumbags hide out in a boardroom, the viewer sticks with these two all the way. Providing just enough quiet time from the relentless violence for Derek and secret hesher Melanie to argue on the quality of Dave Matthews Band and kindle attraction, director Joe Lynch keeps a fun vibe going when this could have just been an onslaught of brutal, meaningless executions. Not to put too fine a point on it, a little of “Mayhem” still goes a long way, but it is a delirious blitz, the perfect kind of primal midnight movie that would play like absolute gangbusters with a loud, boozy crowd at Alamo Drafthouse.